It’s very stressful to run late. No matter what the reason, when we’re late, there is a tendency to feel bad about ourselves, beat ourselves up, and notice everything else that is going wrong. Not only does this not feel good, but since we’re tuned to a low vibration channel, we end up attracting more of the same. From our vantage point, your one job is to see if you can change that trend… to shift your vibration to one of even surprising calm confidence. Ready to shift your vibration? Listen now! Tired of getting in your own way? 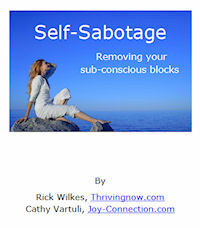 Want to uncover some of the blocks and fears that are creating conflicts and sabotaging your efforts? This package targets some of the main blocks to self-fulfillment of any kind. Look at the ways you sabotage yourself and why, understand key reasons people procrastinate and tap them away, look at ways you might subconsciously think you deserve to suffer (and change the beliefs! ), and ease internal conflicts that keep you locked in place.